This series is inspired by Rose’s reading of a children’s book called Invisible String about helping children to feel safe and attached by Patrice Karst. It seems helpful to think about the ideas in this book when the child or young person is starting a new school as we are at the beginning of a new school year with many transitions, new teachers, new friends and difficult challenges to face. 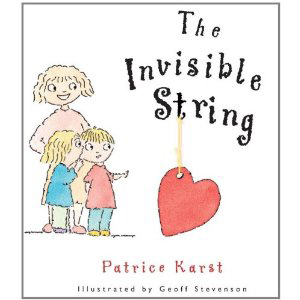 This story for young children inspires the idea that between family members and friends the ties that bind and keep children and young people can be imagined as invisible string. The connection is never broken and helps the child to feel good about themselves when they are struggling or upset or far away or in this instance going to school. The central idea is that it is knowing that the attachment figure cares and is thinking about them that gives enough confidence to overcome current trials and tribulations. We find in our work at Brighton Therapy Service, that it takes perhaps a very small shift in relationships for the child or young person to communicate to their parents to a teacher or if needed to a therapist how they are feeling. The first step in solving a very large range of problem behaviours is starting to feel understood. In other words the invisible string is to know that someone is thinking about you and cares about you. The children in the story learn that wherever they are they are still connected to their family and friends by invisible string and this idea helps them to feel safe , to go to sleep at bedtime, and to go out into the world on their own, perhaps to start a new school. Many children feel scared about starting a new school or class, perhaps they do not have the friendship group that they would like, perhaps for various reasons they find the work hard, feel out of place or even feel bad about themselves. Not feeling good about yourself is not on the curriculum and yet is, we find, so widespread as to be almost an epidemic. Low self esteem can be compounded by stress at home, perhaps by an illness or a bereavement, by being bullied or feeling unable to achieve and children can start to have what amounts to an anxiety disorder or a conduct disorder at a very young age. It is a curious fact that whenever life gets hard for children they always blame themselves unless an adult helps to put it in perspective. Feeling alone or disconnected can lead to many problems, perhaps sleeping or eating problems, or to becoming argumentative confrontational and becoming difficult to parent. In older children feeling bad about yourself can lead to self-harming or even to suicidal feelings, to anxiety or depression, or where the feelings are directed against other people to being defiant, aggressive and showing a range of challenging behaviours at home or at school. In this series Rose and Michele will focus on each of these problem behaviours in more detail offering advice to parents and to young people about a range of difficult problems they may face. But at the heart of solving all these problems is the need to try to negotiate to listen and to help the child or young person know that the adults in their lives want to help them to find their own solutions to the many problems they may face. So when they start a new school and feel unable to manage in a new environment, miss their parents or feel unsafe, they know they do not have to feel scared or alone because of the Invisible String connecting them to those who care.